Montreal, September 13, 2011 – This morning, McGill University and Shriners Hospitals for Children®-Canada announced the creation of the Francis Glorieux Chair in Pediatric Musculoskeletal Research at the hospital in Montreal. The $3-million Chair, established at McGill University and based at Shriners Hospitals for Children-Canada, is an academic appointment which will serve to attract or retain world-class scholars who pursue the understanding and treatment of complex orthopaedic conditions. An endowed chair is among the highest distinctions awarded to a scholar in recognition of past and potential original academic contributions in his or her area of expertise. The person appointed to an endowed chair may be a current faculty member or someone from another institution. The annual income generated from the endowment may be used to supplement the chair-holder’s salary or to help support his or her graduate students, research personnel, research-related travel, equipment and – in the case of newly-recruited professors – start-up funding for their research. “The Francis Glorieux endowed chair is the first of its kind in the 22 hospital system and recognizes a brilliant scientific leader whose tireless effort and devotion have helped our pediatric patients around the world. This endowed chair also represents a new permanent financial resource with which to advance further research, teaching, and the care and treatment of our patients, thereby helping them to lead productive and fulfilling lives” said Raymond Novak, Ph.D., Corporate Director of Research Programs, Shriners Hospitals for Children International. Francis Glorieux’s, M.D., Ph.D., career at Shriners Hospitals for Children spans 38 years of firsts. Dr. Glorieux came to complete his doctorate in Montreal and discovered a fascination for medical research. He was then recruited by Richard Cruess, M.D., to establish the first research laboratory in the system at Shriners Hospital for Children in Montreal in 1972. In that first year the hospital’s research staff consisted of two armed with a budget of $150,000, where today it stands at $4 to $5 million with a staff of 50. “His vision from the very beginning was not just to treat a disease, but to fully understand it,” summed up René St-Arnaud, Ph.D., Acting Director of Research at Shriners Hospitals for Children and Professor of Medicine, Surgery and Human Genetics at McGill. Dr. Glorieux’s research over the last four decades has been nothing short of groundbreaking. He developed a hormone replacement therapy and mapped out the gene responsible for vitamin D-resistant rickets. Further research led to adapting the use of existing osteoporosis medications on children with brittle bone disease, discovering three more types of the disease in the process. Academically Dr. Glorieux’s published works have had an important influence on a generation of researchers, having published more than 31 book chapters and more than 232 articles in leading scientific journals, including Science and the New England Journal of Medicine. Dozens of awards and recognitions for his contribution to the understanding of bone disorders followed, and in 2004 he was named an Officer of the Order of Canada for his outstanding contribution to Canadian society. The Francis Glorieux Research Chair was created on the eve of major changes for the Shriners Hospital for Children, as it prepares to move to the McGill University Health Centre’s Glen campus. There, in spacious new facilities and in close proximity to the MUHC’s state-of-the-art research and treatment facilities, the new Shriners Hospital for Children will be in an ideal position to provide the best possible care to children from Montreal and around the world. 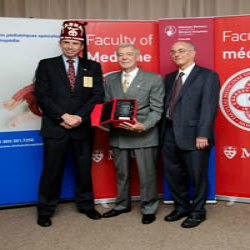 “In a few years, as we move to the new hospital on the Glen Campus in which we have planned to increase space dedicated to research threefold, the addition of this Chair will enhance our ability to recruit the next generations of scholars and will provide future leadership, vision and expertise that will expand research and teaching at Shriners Hospitals for Children – Canada,” said Robert Drummond, M.D., Chairman of the Board of Governors of Shriners Hospitals for Children-Canada, who hosted the press conference. Shriners Hospitals for Children is an international healthcare system dedicated to improving the lives of children by providing pediatric specialty care, innovative research and outstanding teaching programs. Every year, the 22 hospitals provide care for thousands of children up to the age of 18 with orthopaedic conditions, burns, spinal cord injuries, and cleft lip and palate, in a family-centered environment, without financial obligation to patients or their family. Shriners Hospitals for Children relies on the generosity of donors to deliver this mission every day. Located in Montreal, Shriners Hospitals for Children - Canada is a bilingual, short term, acute care centre providing elective pediatric orthopaedic health care. The role of the hospital is to promote health and to provide treatment and rehabilitation to children with orthopaedic and neuromuscular problems. The hospital is committed to excellence and innovation in clinical practice, research and education and to providing a caring environment to families. The hospital is affiliated with McGill University and provides clinical experience and teaching for residents and allied professionals. The hospital is present in communities across Canada thanks to Telemedicine, Outreach Clinics and since January 2009, a Satellite Clinic in Winnipeg. Shriners Hospitals for Children -Canada has been helping kids reach their full potential since its opening on February 18, 1925.